Track dynamic elements on your website by assigning new URLs to them and set them as goals for better conversion tracking. What are Virtual Page Views? Virtual Page Views send a page hit to your Piwik PRO instance without reloading the page. For example, you can use this feature when placing a contact form on your website or a lead capturing form on a landing page. Then you track form submission just like other pages on your site. Virtual Page Views lets you set those actions as goals, so you can add them as steps in your funnel reporting. 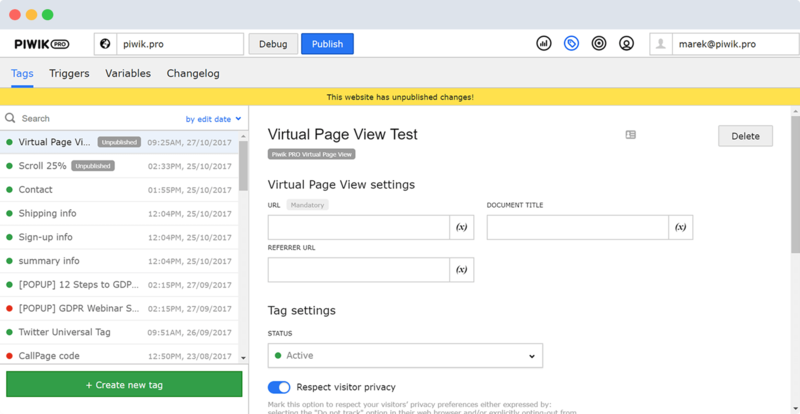 Unlike event tracking, you can use Virtual Page Views to track any dynamic element, and set up a virtual page as a goal in your Piwik PRO platform. Virtual Page Views in Piwik PRO allow you to attach a page view to PDF, DOC, and other files hosted on your website. Track web form submissions and multi-step dynamic shopping cart pages even if they use the same URL. Use Virtual Page View and see how many times your video has been played, how many users finished watching it, and where they stopped. How can you benefit from Virtual Page Views? Piwik PRO Virtual Page Views measures the effectiveness of dynamic actions like buttons and forms. You can track downloads of text files, contact form submits, and shopping cart pages just like a page being loaded. …you want to track dynamic elements which do not generate page views. In Piwik PRO you can add a new step to your conversion funnel by setting them as goals. …you want to track interactions with items like buttons and videos, but you don’t need to include an event as a goal. Events are also a better option if you are worried that virtual page views will distort your page views tracking and other metrics.